Fellini Days, the new Studio Album has been released on preorder. Cowritten by well known tour guitarist John Wesley and keyboarder John Young, this album has a lot more drive than the previous ones. Rocky, catchy and definitely worth a listen! Besides that, the pre-fog concert of the RWZ tour in Poland has been released on a double CD called Sashimi. The Big difference from CiF is that Fish´s voice is in top form! Candlelight in the Fog, the next in the series of official Bootlegs, will be released in mid July. It features recordings from the US-minitour. It will be a limited 3000 release only available through direct order. Order now at the Co. Scotland! 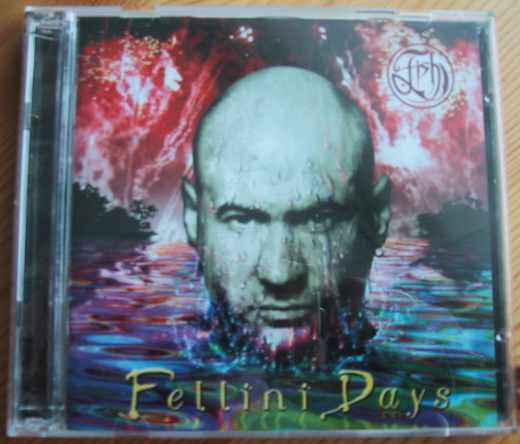 Fish will be releasing his next studio album "Fellini Days" around March/April this year. Join The Company Scotland NOW!!! The next issue (for magazine subscribers) will be a CD-only version, containing PoG live and other tracks!!!! Strictly limited to mebers. So JOIN!!!! The official Fish-Zippo is out and available. A chrome Zippo with the Fish logo and the Text "Raingods with Zippos World Tour 1999 - 2000". Available at the Company Scotland in the Merchandise section, only 20 Pds.!!! "Fish - The BBC Sessions" have finally been released!!! There had been rumors for months as some suppliers had them listed, but not available. they contain the complete BBC radio recordings in superb quality. I know there have been a lot of boots containing excerpts of these recordings, but the quality of this "official recording" is far superior. Fish has added his comments in an eight page booklet. It is available at The Company Scotland in their Merchandise section. London on November 11th 1989 while the other was recorded at the Royal Concern Hall Nottingham on November 15th 1991. Both these concerts are now available on a double CD set 'Fish - The Complete BBC Sessions' BP297CD. We have now acquired copies of this title for our merchandise service and this double CD set is now on the merchandise list as FS040 costing UKP15 UK and UKP16 ex UK including postage and packing. Members will receive a UKP1 discount on these prices. There are sleeve notes provided by myself as well a colour photographs from the time of the two concerts in an 8 page colour booklet. The Town and Country gig is from the pre-Vigil release tour that was put in place to support 'State of Mind', while the second concert was produced by none other than Mark Radcliffe of Radio 1 fame from the early stages of the 'Internal Exile' tour. The first three tracks on disc 2 are from the Town and Country Club while the rest on that disc are from Nottingham. The quality is extremely high as you would expect from the BBC but sadly, the intros have been deleted due to the programming length for radio. The next single will be Tilted Cross. Fish has asked David Ginola, spokesman of the European landmine commission, to set the single up as a charity record to aid the refugees from Kosovo and the clearing of landmines in that area. The planned release date is late July. Fish has always emphasized what he thinks of what happens in Yugoslavia ("... in Bosnia, we were two weeks late, in Kosovo, wer wer two weeks late again...") during the latest acoustic sessions. With the knowledge of this and his War Child gigs in Bosnia this is a powerful sign!! !